Having missed the opening day of the tournament yesterday due to work commitments, today was my first day at the Barbican in 2014, with three sessions to be played across both the main arena and the increasingly notorious sports hall. As I have continued to visit tournaments in recent years and established relationships with various people on the circuit, from players to officials, from media to referees, i have increasingly enjoyed the camaraderie on the tour and so it was good to catch up with familiar faces. 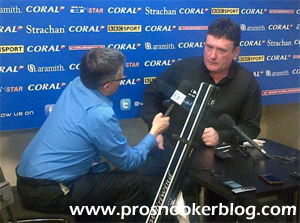 On getting set up in the media room and catching up with the scores, I was soon joined by Eurosport commentator and snooker journalist Dave Hendon, shortly prior to John Higgins’ press conference following his 6-2 victory over Lee Walker. 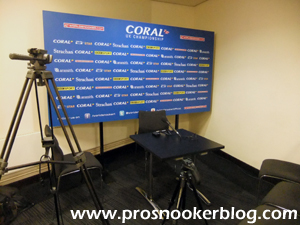 As has been the case during the past two or three years here at the UK Championship, inevitably a large part of the press conference covered ground such as the format changes to the tournament since 2011. As he explains in the video below, John explains amongst other things how the tournament has been devalued since th emajority of matches were reduced from best of 17 frames to the best of 11, whilst also discussing the fact that some players have had to play in the sports hall, rather than the main arena. While I continue to mourn the loss of the best of 17 matches as much as anyone, I do think that the time has come to move on from that debate and to just enjoy what is still a highly prestigious tournament. In fairness to Higgins, his comments are far from the most critical that I have heard and he is also keen to stress some of the reasons for the changes that have been implemented. Ultimately he is only answering the questions put to him in an honest way, which I wouldn’t fault him for. I hope that by the time we get to the weekend and beyond, the talk can move on from how the tournament has or has not been devauled, to what an enjoyable event we still have. Format changes aside, Higgins was in fairly good spirits, withstanding some daring questions from the aforementioned Dave Hendon as to whether he believes that his form will ever come back. Or words to that effect. John was later followed into the press room by Ben Woollaston, who came back from 2-0 down to see off Michael Wasley in one of the harder first round matches to call, while Martin Gould was also a winner against Lee Page. Following a catch-up with various people around the venue, I headed on up into the arena for the first time to sample the atmosphere of the afternoon session and was impressed to see that there were a large number of spectators in attendance. 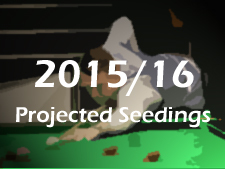 Thinking back to 2013, during the opening days the only matches played were those in the sports hall and from what I hear that particular part of the venue, its attendances have suffered due to the highest profile players being in action in the arena this year. Still, the crowd levels were good in the ‘stalls’ close to the tables, while I headed on up to the balcony, which is for me one of the best places to watch snooker in the UK. In action were Ding Junhui and Jimmy White on the two main tables, Jimmy taking on Dave Harold in an important match for both in terms of staying on tour. From a very early stage, it became evident that Ding’s opponent John Sutton was going to struggle to take a frame, while both Jimmy and Dave looked nervous on the adjacent table. Having gone into the mid-session interval level at 2-2 however, Jimmy found his rhythm after the break and with a break of 110 along the way, was able to run out a 6-2 winner and set up a televised match with Ding Junhui on Saturday afternoon. 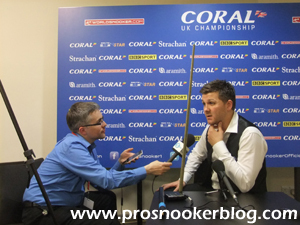 Coming into the media room, Jimmy explained that it was nice to play in a ‘proper’ arena and that he would be up for a match with one of snooker’s top four players at the moment. For those of you in and around the venue, he will be carrying out a book signing session at Waterstones here in York tomorrow morning. Elsewhere, there was a rare victory for an unseeded player on one of the outside tables, as James Cahill ran out a 6-0 winner against former UK championship semi-finalist Mark King. 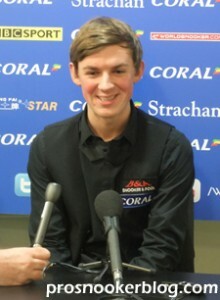 A player who I have noticed has improved significantly during the past six months or so, it was good to see James take a scalp of King’s calibre and he gave an interesting press conference as we asked him about life on tour and what he has learned during the past 18 months since turning professional. “I knew it was going to be hard. I didn’t have the greatest first season, then in your second season you have to make two years up really, so the PTCs this year are a good way for me to stay on, so these tournaments unless I have a good run in them, I am just trying my best to do as well as I can and see how far I can get really. 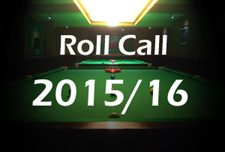 “To be honest, you just learn to play in the environment. I was quite a good junior and then I have come up and you re playing against these players and you are learning all the time, sometimes you don’t even realise what you are learning, you just are and it’s that experience that you need. “I know, he didn’t look like he was playing well but when you play someone like Ronnie, it’s hard not to…I was trying to go in thinking, try not to play Ronnie and not play the balls, but that’s easier said that done! Elsewhere, there were a series of increasingly amusing tweets from Mark Williams, who was taking in a frame or two of Andrew Pagett’s defeat to Mike Dunn over the in the sports hall, perhaps he will start a blog one day, while Tony Drago pulled off a surprise win against Dominic Dale to reach the last 64 here in York. 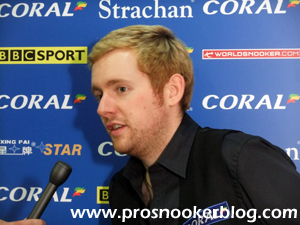 Speaking with Dominic both before and after the match, he clearly sounded the worse for wear following a virus picked up whilst in Germany at the recent European Tour 4 event and suggested that next year he might opt out of the event prior to the UK Championship to prevent that from happening again. Take nothing away from Drago though, who hit a break of 109 on his way to victory. 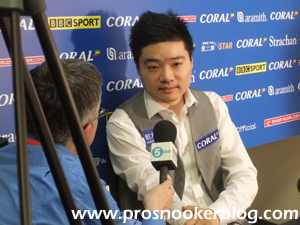 Entering the room soon after was Ding Junhui, who spoke about having followed Jimmy White as a top player when he was growing up and looking forward to their match on Saturday. I asked him a question what it would mean to become world number one after the event if he could manage that, to which he said that he would prefer to be number one at the end of the season. Following an adjournment to the local Indian restaurant, with Jimmy White already in situ following his victory earlier, it was back to the venue for the start of the evening session, featuring the likes of 2012 champion Mark Selby, Ricky Walden against Steve Davis and Brazil’s Igor Figueiredo, in action against Fergal O’Brien. The first to finish however was Welshman Ryan Day, who was on for a 147 during the final frame of his victory against Lyu Chenwei. Having spotted that he was on 80 whilst following the livescores here in the media room, I sprinted on up to the arena, only to be greeted by the groans of the crowd as he broke down on 97. Worse still for Ryan came when he explained during his press conference that he did not believe that the prize for a 147 would have counted today due to the match being during the ‘non-televised’ phase, before World Snooker’s press officer Ivan gave him the ‘good’ news that it would have. Not wanting to earn Ryan a fine, I won’t recite his reaction here! 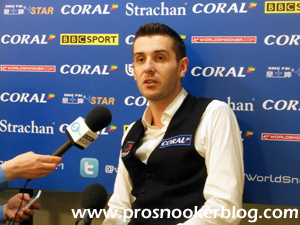 Next over the line was Mark Selby, unsurprisingly a comfortable winner against Oliver Brown and in good spirits with us after his win, talking about his new status as a father. Naturally you would perhaps expect his game to have suffered to some degree given what must have been a busy couple of weeks, but time will tell this week. 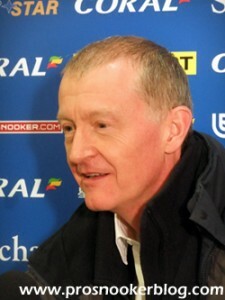 The most entertaining press conference of the day came from Steve Davis however, as he discussed his future in the game and how mentally he has almost retired, but physically his body keeps turning up to tournaments. With a Dr Strangelove/Peter Sellars reference thrown in which went way over my head, it was an entertaining way to help round off the day. Ricky meanwhile was obviously pleased to be through and described how it felt to play a ‘carefree’ Davis, something that he clearly found unusual. ‘visa issues’ for Rouzi Maimalti? Or is he planning to only play APTCs and the worlds?